When you say "Ethiopia" most people will think about the slogan "feed the world." But this East African country has more than humanitarian assistance and gnaws children. This is the only country in Africa, which has never been colonized, and people here have a strong tradition of struggle for their independence. The country is also unusual its rich Orthodox Christian heritage, while their neighbors were amenable to Islam, who came here in 7 century. Traveling to Ethiopia is hard rest, because this country does not has a developed tourist infrastructure, here you can not even check your e-mail. But here you will see stunning landscapes, hospitable people, an impressive history, and no mob rambler tourists. And, of course, residing in Ethiopia will cost you quite cheap. National particularities: In Ethiopia, people talk nearly 80 languages. These languages belong to different linguistic groups. Amharic language, spoken in the center of the country, particularly in the capital, is the state language, but Tigrinya and Oromo, spoken in the north and south of the country are semi status. Oromo - the largest ethnic group in the country and it constitutes an artful Christians with Muslims and traditional animists. Amhara and Tigray use Ge'ez alphabet, which contain 231 letters. Children begin learning English from an early school age, and therefore everyone in the country, one way or another, spoke in English. 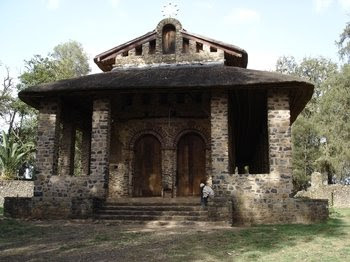 The Ethiopian Orthodox Church dominates the religious life of the country from 4 century, when two brothers from Tyre began to preach Christianity with the blessing of the ruler of Ethiopia. The church is part of Coptic Church, which is headquartered in Alexandria, Egypt. The Orthodoxy combines common Christian faith in God, Catholic saints and Jesus (although it is paying more attention to the Old Testament than Western churches) and traditional African beliefs in spirits and the devil. In church services include astrological predictions and Divination. Believers post every Wednesday and Friday, not using dairy products and meat. 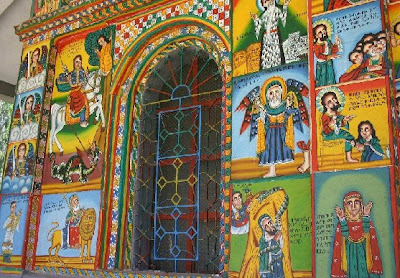 Ethiopian literature has traditionally Christian orientation, and ancient manuscripts are translations of Greek Christian works. Alphabet Ge'ez originates in the 13 century when the Coptic, Syrian and Greek religious works were translated from Arabic. After 200 years, the monks begin to complement the original works, describing life and creating apocalyptic holy book: "Secrets of the heavens and the earth", Elucidation of Jesus. Amharic language alphabet Ge'ez took about 16 centuries. The Ethiopian music is extremely diverse, with each of the country's 80 ethnic groups being associated with unique sounds. It is uses a unique modal system that is pentatonic, with characteristically long intervals between some notes. Holidays: Genna, Epiphany (19 January), Victory of Adowa (2 March), Patriots' Victory Day (6 April), Labor Day (1 May ), Good Friday, Id al-Fitr, Ethiopian New Year (11 September), Revolution Day (12 September ), Meskel (28 September ), Id al-Adha, and Birthday of Mohammed. 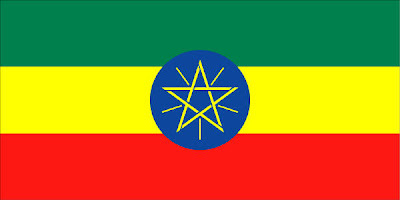 Geography: Ethiopia is located in the eastern part of the African continent and is landlocked. In the west, it borders with Sudan, in the north with Eritrea in the east to Somalia and Djibouti and Kenya in the south. Ethiopia occupies an area of approximately 1127000 km². Climate: While Ethiopia is quite close to the Equator, at the central plateau country's temperate climate with an average temperature of about 16 ° C. Only in the east, near the Red Sea and the west, on the border with Sudan is very hot. Kremt - the rainy season begins in mid-June and ends in mid-September. And in March and April rains are rare. Ethiopian capital is home for 3 million people. The city was founded in 1887, and soon virtually empty due to lack of firewood for heating, it was before in the country have put eucalyptus. This is spacious town, where most streets do not have any pointers, but this does not apply to the main street of the city - Churchill. The ethnographic museum in the city is interesting for visit. Here are two main sections: local crafts and nations living in Ethiopia. This is a good place to study Ethiopia and its ethnic diversity. Here is an enormous collection of religious sites: crosses, icons and triptychs. 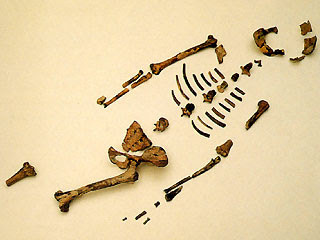 In National museum of Ethnography there are fossils, dating back 3.5 million years old Lucy skeleton unearthed in Ethiopia in 1974, and perhaps they are the oldest on the planet. Her name taken from a Beatles song that played in an archaeological camp the night of her discovery. The Ethiopian public has seen Lucy only twice — the Lucy exhibition at the Museum is a replica; the real remains are usually locked in a vault. The African Hall is the headquarters of the Economic Council of the UN in Africa, and he placed the monument in the form of African independence. Mercati in Addis Ababa is the largest market in Africa. This is a huge area filled with counters in the open air, where you can buy anything from fruit to jewelers. The cheap hotels in Addis Ababa are a combination of bustling street of bars, brothels and several rooms. Foreigners typically pay two times more than local. Most hotels are located around places, where a lot of cheap cafes and bars. While the Italians ruled the country only five years, but in almost every town in the country you can dine in the Italian restaurant. 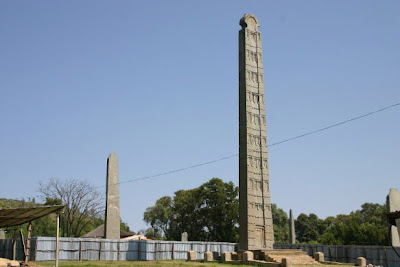 Axum is the holy city of Ethiopia. According to teachings of the Orthodox Church, the epitome of religious relics can be found here. Also in this city in 4 century AD Christianity was declared as the state religion. The casket presumably is under the Church of St. Mary, dating from age 17, but of course nobody can see it. The small church museum has an excellent collection of Bibles, crosses and religious headwear. Behind the museum is an ancient Stella field Axum, the only reminder of the bygone glory of the city. Stella - huge, indoor columns made of granite monolith; one of the pillars has a height of 23 meters. If you take a walk on the outskirts of the city, you can inspect the ruins of the Palace of the King Kaleb and then to the hill where is the monastery Pentalion. Women are not allowed in the monastery. The ruins of the Palace of Sheba also located outside the city, and during the recent excavations, it was proved that the palace 1300 years, rather than 2000 as previously thought. Bahar Dar is situated on the southern shore of Lake Tana. Alone Bahar Dar is not remarkable place, but its vicinity has many attractions. There are many islands in the Lake Tana. Some of them have become home to monasteries. Many of these monasteries were built in the 11 century, and the rest until 16 century. 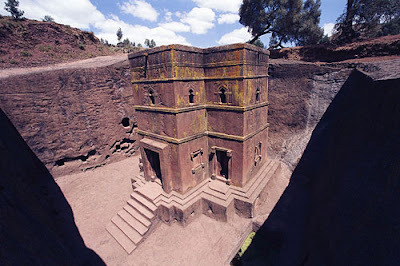 The most famous monasteries are: Kidene Mehret, Kebran Gabriel (women are not allowed here) and Debre Mariam. 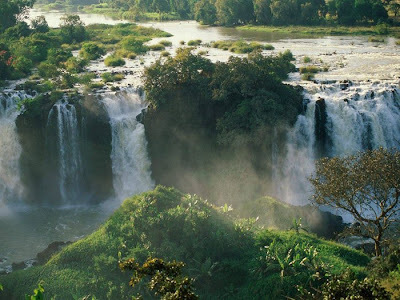 Waterfalls Blue Nile is in the 45-minute drive from Bahar Dar. These waterfalls are 400 m width and height of 50 meters, local residents called Tis Isat. Their appearance is impressive in any season, but they look best from October to December. Seven Lakes Valley faults are located on a broad and fertile valley of the plateau, which is located between Addis Ababa and the Kenyan border. This is the best place in Ethiopia to observe the birds. The lakes Lagano, Abiyyata and Shala are the most popular of the seven, one is blue lake, another is silver, and the third is brown. Abiyyata is small lake and its shores clouds of waterfowl habitats. The lake Shala is in deep crater of 50 meters. In addition, around the lake there are several hotels. You can swim in the hot keys Vondo Genet, south of the three lakes. In the lakes Abaya and Chamo, which are near to the Kenyan border live variety of birds and animals, including crocodiles. 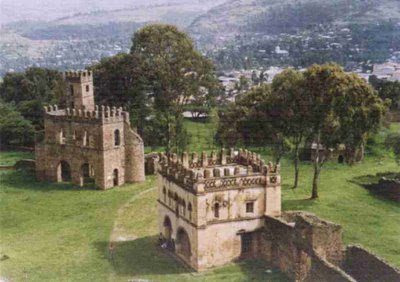 In 750 kilometers north of Addis Ababa is Gondar, which was the capital of Ethiopia, with a time of its foundation Emperor Fasilidos in 1632, until 1886. Interesting additions to inspect Royal building, 76 000 sq m area, built in 1640 century. You can also visit the bathhouse Fasilidos, which is after 2 kilometers from the city. 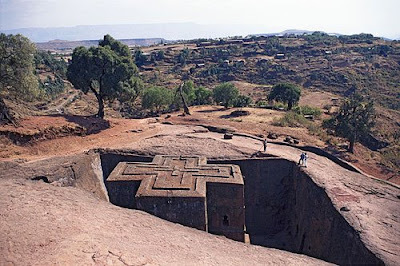 Lalibela is famous by its delightful 12-century churches, cut into rocks. All 11 churches were built over a century, and it is believed that angels helped builders who built made at night improve human hands. Church for many centuries kept priests who have served God, a copy of the treasures, sanctifies Bibles and illustrated manuscripts. In this park dwell a lot of animals and birds, which you can observe in the wild. 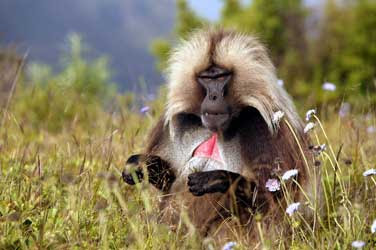 There are baboons, ibexes, foxes, as well as birds, including birds of prey, for example, huge vulture. The park is a rocky massif, descending to the fields, is divided into narrow gorges. Pedestrian routes are calculated on the journey from three to ten days, and you can move both on foot and riding on mules. The trail lay to ancient African mountain peak Raz-Dashen. Tours begin at Debrake, which is located 100 kilometers from Gondar. been here :) nice page please visit mine http://nicotinesworld.com ty!